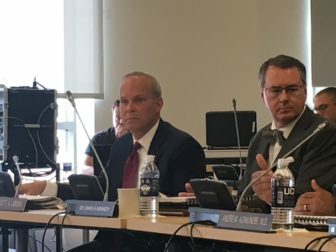 While adopting a new budget that maintains the existing tuition schedule, University of Connecticut officials simultaneously expressed concerns Wednesday that declining state aid could soon take a toll on class sizes, academic aid, and support services. The Board of Trustees nonetheless voted unanimously to adopt a $1.25 billion budget for the fiscal year beginning July 1 for the main campus in Storrs, as well as the regional campuses. That package is balanced, in part, by a 4 percent tuition hike that the trustees authorized in December 2015 as part of a four-year schedule of tuition adjustments. But university officials also warn that the new budget, unless adjusted, is not sustainable beyond the new fiscal year. By 2019-20, university finances are projected to run $29 million, or 2.2 percent, in the red. By 2020-21, the potential shortfall is expected to reach $63 million, or 4.6 percent. “Fewer professors doing research, fewer professors to teach courses, and we end up having part-time instructors and adjuncts,” added Craig Kennedy, provost and executive vice president for academic affairs. Thomas E. Kruger, chairman of the Board of Trustees, said the trend is concerning not only because it is driven by declining state aid, but also because of the limited array of unpleasant alternatives it leaves the board. Nothing is certain at this point, but neither Kruger nor UConn administrators would rule out the possibility that another tuition hike, or series of hikes, would have to be considered — possibly as early as the fall of 2019. If any increases were ordered at that time, though, they likely wouldn’t take effect before the fall of 2020. State support for UConn operations has eroded steadily for nearly three decades, but the drop-off has accelerated since the last recession ended eight years ago. The state budget is strained by surging pension and other retirement benefit costs tied to more than seven decades of inadequate savings by legislatures and governors. The state effectively has shifted a portion of this burden onto its public colleges and universities. The hefty fringe benefit expenses the institutions must cover reflect not only the cost of setting aside funds for present-day workers’ retirement benefits, but also make up for a portion of the pension contributions the state failed to make in the past. Overall proposed spending is up about $35 million in the next budget, or just under 3 percent, from the current fiscal year. The growth largely is driven by a 28 percent increase in fringe benefit costs. Most segments of state government, including UConn, are in the midst of a four-year concessions deal with state employee unions. That agreement largely prohibits layoffs through the 2020-21 fiscal year, limiting the ability of state agencies to control labor costs. Most unions also agreed to a wage freeze in the current fiscal year, which ends Saturday. UConn President Susan Herbst said it is essential that the university ensures that students, parents, and the public at large are aware of these fiscal challenges. “University budgets are complicated, so we have to keep explaining ourselves so people understand that,’ UConn President Susan Herbst said, adding that no one wants to see student-to-faculty ratios grow even larger. But Senate Republican leader Len Fasano of North Haven, a frequent critic of the UConn administration, said the potential for more tuition hikes in future years is a problem that could have been avoided. 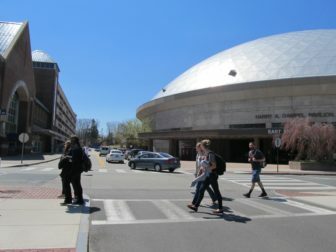 For a Connecticut resident living on the Storrs campus, tuition and fees will rise from $27,394 this past academic year to $28,804 in 2018-19. For out-of-state students, the total rises from $49,462 to $50,972. The trustees also unanimously adopted a $1.05 billion budget for the Farmington-based UConn Health Center for the new fiscal year. That budget, too, is plagued by similar increases in fringe benefit costs. And though fiscal projections haven’t been completed yet, Jeff Geoghegan, the health center’s chief financial officer, said that facility is likely facing projected deficits in the first two fiscal years after the new budget. Tuition at the medical and dental schools will increase by about 4 percent this fall under a previously adopted tuition schedule. But tuition provided a tiny fraction — about 2 percent — of the revenues needed to support the health center’s annual spending. More than 60 percent from patients and other revenues is tied to John Dempsey Hospital, which is part of UConn Health Center. State funding, along with research and foundation grants, provide the bulk of the remaining revenues. The main UConn budget also will be supplemented by a $113.2 million research fund and a $360 million capital projects budget. The health center budget will be supplemented by a $23.7 million research fund.